How should we think of the material world? How to conceive of nature, objects, technology, bodies – the ‘stuff’ of social life? This is a question which the social sciences have become increasingly comfortable tackling. And none have tackled it with quite the same wide-eyed enthusiasm as those theorists working on what became known (to Anglo-American users) as actor-network theory. 1 The originality and charisma of those writings has made that enthusiasm quite contagious, and as a consequence ANT’s picture of the material has permeated much contemporary sociological thinking which concerns itself with science, technology, organization, or some blend of the three. In many ways this is a good thing. ANT has shown that ontology can be successfully liberated from scientists and professional philosophers (whose accounts can be inaccessibly technical or bafflingly obscure) and explored through sensitive empirical inquiries. It has pointed to ways in which questions about materiality can be made amenable to sociological analysis. But the type of ontology which ANT has elaborated can often appear as much a child of its intellectual climate as an outcome of such empirical research. That is to say, ANT’s ontology has a distinctly late 20th century flavor, characterized by a commitment to relational-holism, which, I believe, fails to capture fully much of what is significant about the material world. It is my intention to lay out, despite the heterogeneous nature of the perspective, the ontological assumptions which link most ‘ANT and after’ thinking. With that picture clear I then want to elaborate another materiality practiced by industrial designers which, I believe, could be a powerful internalist counter-weight to ANT’s heavy handed, and often unexamined, relationality. An ontological holism . Particular entities are thought of as the consequences of, and as characterized by, some wider fabric of relations. A nominalism or localism. As a consequence of the relationality of entities similarities (or differences) between particular things or happenings rest, ex post , upon facts external to those things or happenings. A constructivism . As such nominalism undercuts identity a language of ‘making’ must be privileged over a language of ‘finding’. The first of these characterizations is stated clearly by Law (1999 :3): “Actor network theory is a ruthless application of semiotics. It tells that entities take their form and acquire their attributes as a result of their relations with other entities. In this scheme of things entities have no inherent qualities.” Particulars are established relationally in a sense roughly analogous to some loose version of Saussure’s semiology. They are network effects. 3 ANT then could be thought of as a variety of “bundle” theory ( Heil, 2003 :108-9). Particulars can appear individual enough, but that individuation and isolation can quickly give way to a distributed network of ‘outside’ elements. The distinction is similar to the one that Heidegger drew between the ‘ontic’ and ‘ontological’. To say that an object is a ‘network effect’ is to say that, properly viewed, it reveals itself as a bundled knot of others. This was, of course, the origin of the term ‘actor-network’. It denotes the tension between centered and distributed particulars, between an atomic and holistic ontology, between deworlding and world. The only real reason why it should not be called ‘particular-network’ or ‘individual-network’ theory is that as a sociology its interest has tended to be in ‘actors’ – actors who, even in their autonomy, show themselves to be “actor-worlds” ( Callon, 1999 :185; Callon, 1986 ). An actor (or rather any individual thing), for ANT, is constituted by its relations to every other relevant entity (its world). And it is with such a conception of particulars that ANT is able to perform some its more intriguing analytic moves. For instance such bundle-thinking enables analysts to sidestep the content-context distinction (and so, at times, that between nature and society). Aramis was not, for Latour (1996) , an entity which failed because the context in which it was situated became hostile. Rather those things which might be called context folded together to constitute it, and as those relations withdrew, Aramis ‘died’. Law’s Portuguese carracks ( 1986 ; 1987 ) provide another canonical ANT example, being as much politics, mathematics, ocean and wind as wood and sails. Again, de Laet and Mol’s (2000) Zimbabwe bush-pump study depicts an entity at once small enough to load into the boot of a car and again as large as the Zimbabwe nation itself, as new relations are explicated. What seemed – to the more ontic observer – a bounded individual object which moves with integrity through different environments, now appears ‘fluid’. It contains its environment (Ibid:252,262) and so as that changes, so does the pump. Because such entities are the effects of relations – because they are characterized by those others to which they relate – there is no need to speak of a context or an ‘outside’. They already ‘are’ everything which is relevant to them. Similarly such thinking breaks down the distinction between perceiving subjects and objects perceived. Pasteur’s encounter with the lactic-acid ferment ( Latour, 1999a :113-44) was not characterized by a ‘phenomenon’ in which human reason came into a corresponding relation with an indifferent thing-in-itself. Rather, employing Whitehead’s formulation ( Whitehead, 1929 ; Latour, 2005b ; Stengers, 2002 ), it was a ‘concrescence’ – an ‘event’ in which all entities relevant to the encounter were modified. A similar, less complex, example is offered by Latour (2004b) is his re-reading of Teil’s (1998) account of perfume industry-training. The notion of articulate or inarticulate propositions (as opposed to true or false statements – another loose borrowing from Whitehead) is employed here to suggest a more or less fluid infra-emergence of characteristics: “acquiring a body is thus a progressive enterprise that produces at once a sensory medium and a sensitive world” ( Latour, 2004b :207). Primary qualities and intrinsic properties are pushed aside in the interests of mutually elaborated compositions. It is in relations that odors and noses emerge – are articulated – and Latour is quick to emphasize that this is an ontological, not a linguistic, affair. So ANT’s objects (and subjects) are relational entities. They are ‘things’ in Heidegger’s (1971a , 1971b ) sense (gatherings), rather than ‘objects’. 4 A Portuguese carrack on land is not the same object once it is in the Atlantic Ocean, which itself is altered by the presence of the ship. A more or less radical nominalism follows on from this. The kernel of such a view is offered up by Nietzsche (1996 :22) who speaks of “the error... that there are identical things (but in fact nothing is identical with anything else)... The assumption of plurality always presupposes the existence of something that occurs more than once: but... here already we are fabricating beings, unities which do not exist”. In a world in process, populated by completely relational entities without intrinsicality or essence, it would be illogical to make the jump from similarity to identity ( Nietzsche, 2001 :112-3) – to talk of various particulars, events, or causes, as being the ‘same’. This formulation is reaffirmed explicitly by Latour (1988b :162): “nothing is, by itself, the same as or different from anything else. In other words, everything happens only once, and at one place... If there are identities... they have been constructed at great expense”. In other words, because there is nothing intrinsically characteristic of any particular – they are characterized only in terms of their relations with others – there are no extra-relational grounds for two particulars comparison. And so there can be no presumption of identity between DNA in 1900 and DNA in 2000, between an anthrax bacillus in Pasteur’s laboratory and one in a sheep’s intestine, or between a bush- pump in the boot of my car and one that I have subsequently unloaded and installed in a town-square. These entities are all constituted in different networks of relations and so are themselves different. In as much as we can speak of similarity this is a consequence of some costly co-ordinating work: “if it sometimes appears that there are singular objects and singular subjects then, somehow or other, object positions and subject positions have overlapped and been linked” ( Law, 2002a :36). So we have a nominalism in which identity is discarded in the face of a processual relationality. Sameness and difference do not reside in the nature of things. In as much as they exist they are staged ex post . And it is as a consequence of this logic that one of ANT’s most strident criticisms of the claims of science emerges: its ‘experimental localism’ ( Guala, 2003 ). Because if everything happens only once and in one place – if no two objects or events can ever be considered identical – then the claims of (particularly the physical) sciences to have uncovered universal laws of nature are dubious. These laws generally prescribe robust probabilistic or deterministic regularities in events, generalized from carefully staged experiments. But both regularities and generalizations are problematic for the kind of nominalism to which ANT is committed. Regularities presume stable identities to things and events, and generalizations presume that such identities can move relatively unmolested from context to context. Latour’s approach to this problem is to describe regularities and generalizations as the carefully crafted outcomes of networks which, extended painstakingly from local spot to local spot, replicate as much as possible the original local relations from where the story began. Pasteur established the ‘universal’ validity of his anti-anthrax vaccine by extending his local laboratory out into the field ( Latour, 1983 , 1988a :90-3). Universals are not, in this view, discoveries as much as constructions. They are painstakingly built ‘empires’ ( Latour, 1988c :162) – extensions of local relations from setting to setting. So for ANT the material is relational, without intrinsic properties. And so there are no a priori identities. If we can speak of sameness, repetition, or regularity then these have been constructed at cost through the local extension of networks of relations. The next aspect of ANT’s conception of the material – a more general privileging of construction over discovery – follows on logically from this. Now it seems at times that ANT (in particular the latter Latour), like Rorty (1996) , wishes to present an enterprise in which the distinction between ‘finding’ and ‘making’ is discarded. We should not be labeling everything as constructed, and nothing as discovered, as that would be to emphasize the very distinction which we would like to supersede. Indeed at times Latour seems to be suggesting that creation and discovery are simply the contrasting effects of two differing narrative strategies ( Kennedy, 2002 :26-7). The ‘making’ narrative happens to offer a number of useful analytic benefits ( Latour, 1999a :113-73) over that of ‘finding’ (we no longer have to distinguish between belief and knowledge or history and ontology, and the work of science is better brought into view). However, given what we have already know of ANT’s ontology such a neutral ‘contrasting narratives’ line is untenable. There is simply no coherent sense in which we could ever say, given such a commitment to relational materiality, that Pasteur discovered microbes. As we have already seen, an entity with which humans have no relations is not the same entity once humans encounter it. The world ANT describes is one in flux in which every new encounter creates. To talk of discovery would be to posit an ‘external relation’ in Russell's sense – it would be to suggest that the relation between an object and its discoverer is ‘external’ to both, requiring us to accept that the identity of both remained unchanged by that relation ( Johansson, 2004 :112). But as we have seen there is no notion more antithetical to ANT’s ontology. And so discovery is an impossibility. When Latour (1999a :146) suggests that “we should be able to say that not only the microbes-for-us-humans changed in the 1850’s, but also the microbes-for-themselves. Their encounter with Pasteur changed them as well”, this is not a convenient methodological choice as much as a theoretical necessity (in much the same way that we are forced to say that Newton did not uncover regularities in the world as much as set off a fevered extension of Newtonian relations across the world). In as much as ANT is based upon a relational-holistic ontology, begetting a radical nominalism, it is forced – to some important extent – to always privilege making over finding in its accounts. Mol’s (2002) study of the diagnosis and treatment of atherosclerosis works through this idea at some length. Throughout the hospital there are many atheroscleroses. This is not a cute metaphor pointing towards various approaches to, or perspectives on, a singular atherosclerosis, a single patient, or a single body. This would be to think in terms of stable identities, external relations and discovery. Rather they are various objects “enacted” (Ibid:32-33) in practices. 5 They are enacted in complexes of local relations, traveling as far as those relations can sustain them. As new complexes come together so too are new atheroscleroses articulated. 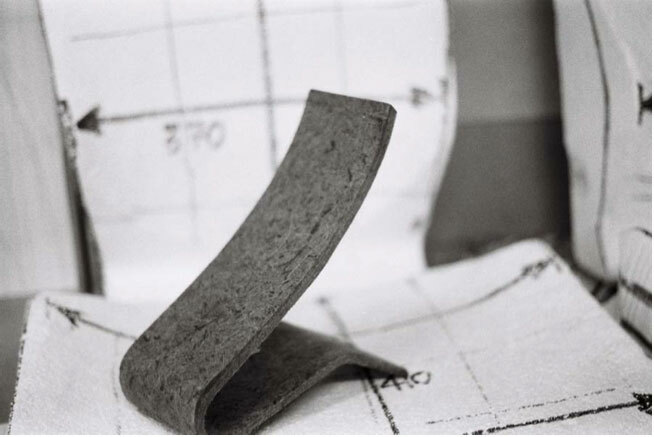 Figure 1: Foreground: A test sample of novel material 'Z'. Background: One of the models which this material has informed. 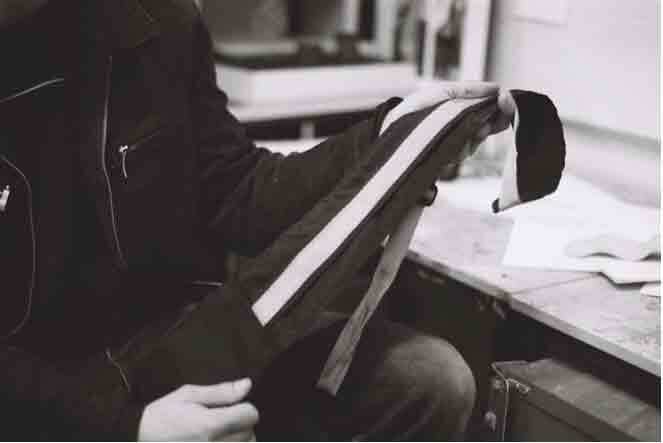 Inari is also building a chair, incorporating an unusual material ( y ). Her project began, unconventionally, with a range of materials which were matched up to a range of different design concepts. Eventually material y , as a component in a piece of public furniture, suggested itself as the most promising combination. 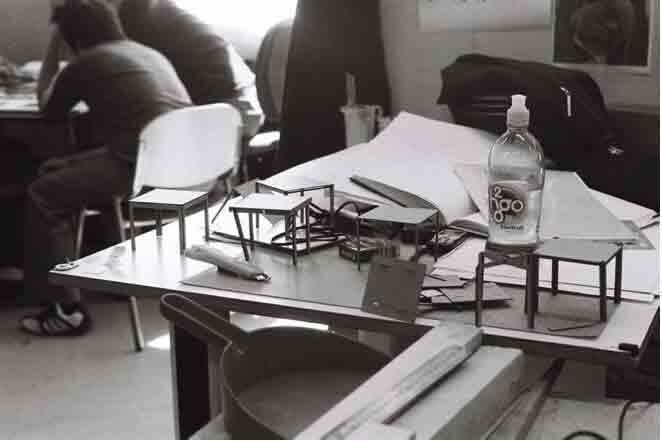 This early planning, and the more specific process of designing the chair, followed an arc in which y was increasingly scrutinized. Inari: I identified the most promising ways that I could use [ y ] to really improve public furniture in different ways. And that was really using it kind of- like a hinge so that it could flex and recline as you sat on it. And that sort of thing as well... the whole aesthetic thing. And then, so, I was basing the form around that [...] The [ y ] is only a very small part of it, like it – it sort of – it allows it to do everything that I wanted the [ y ] to do. How then do these designs, and these designers, ‘do materiality’? Firstly they focus in on specific materials: they engage with them in their specificity. Z and y are decisive influences upon the objects which will emerge from these processes, in that the way these materials behave is incorporated into the design. A strong understanding of materials will always be important for designers (“When in doubt, Make it stout, Out of things you know about” ( Ullman, 1992 :199)), but the students use of novel materials bring this relationship better into focus. There isn’t the tacit understanding of these materials, and they have not been rendered simple and predictable via handbooks (eg. Budinski, 1979 ; Lesko, 1999 ). For Nicolas and Inari the design process is one in which these materials must be tested repeatedly. There is a back and forth between concept and material: conceivable objects must be related back to these materials, which may, in the end, preclude their existence. In other words, as z is better understood, the range of good z -made chairs is altered. The differences between z and everything else, or between y and everything else, become points of difference in the objects into which they are incorporated. (In some modest sense we could even think of them as formal causes – Nicolas’s chair will take some form, rather than some other, in some strong measure as a consequence of z .) For instance there is a sharp dipped curve between the seat’s pan and its back which exploits z ’s flexibility. It is aesthetically pleasing and ergonomically sound, but most crucially it is a z - ish curve . In encounters with the material a select range of specifically z -ish chairs present themselves, and this curved device was amongst them. As these materials are scrutinized a specific range of objects are delineated. The second problem – establishing what parts of the structure should vary – is more complex. But with the ergo-rig he is able to trial various movable parts with a wide range of bodies. As mock users ride the rig he can see what parts need to be adjusted, what parts need to be adjustable, to what degree, and where. Through this “structural evidence” a number of important moving parts in his cycle’s frame will emerge. Nicolas has also been engaged in ergonomic testing. 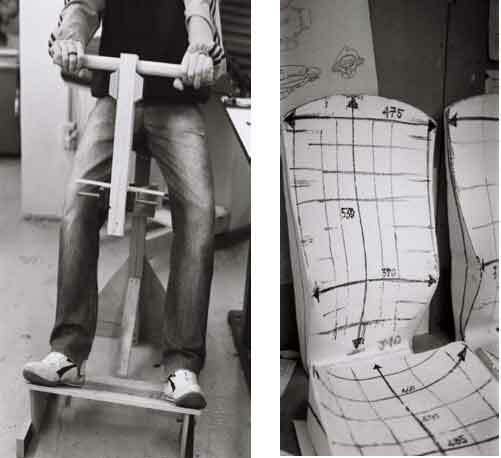 He has made a number of seat-backs and separate seat-pans out of polystyrene ( figure 2 ), and has tested various combinations against various bodies. Such tests are only really indicative (his material – z – will behave differently to the polystyrene) but still serve to suggest certain lengths, certain curves, certain depths... and of course to preclude others. Again we see a movement in which the designer engages in a more or less experimental relation with the material world – with singular materials, with the means by which they are assembled, with bodies – and through this engagement a specific range of design possibilities are raised and another set discarded. Figure 2: Left: Este's 'ergo-rig'. Right: Polystyrene ergonomics mock-ups with interchangeable seat- pans and backs. Figure 3: As the designer engages with the material, the horizon of possible objects (PO) narrows. And what is so instructive about this movement, this closing off of the possible, is how thoroughly realist it is – how at odds it is with ANT’s relation-processual ontology. There were relations of course: relations among, say, Nicolas, a vice and a sample of z ; among Este, a user and his ergo-rig. But these relations were accepted as very much external. They did not reconstitute those particulars, they reconstituted the design. Of course the final product is being constructed, but the means of its fabrication, the character of the materials which would constitute it, or the bodies of those who would use it, are not. The designers’ relations with these entities were ones characterized by sincerity ( Harman, 2002 :238-243; Levinas 1988 ); a sincerity which grants the particular a being; which takes it as “real to the extent that it is in its own right” ( Zubirir, 2003 :40). Indeed the arc of figure 3 is completely underwritten by a materiality quite divergent from that in which ANT trades. Inari picks up a large piece of y and considers its possible application as a flexible hinge between sections of a bench. As her tests progress, it becomes apparent that when supporting certain weights, at certain angles, y fails. And so in line with the movement I have been describing in figure 3, these experimental encounters now leave Inari with a narrower range of possible objects (certain bench-back weights are now precluded, certain strains on the y component will be avoided...). The material ( y ) becomes in some sense explanatory of some possible-benches’ failure, in as much as facts about y explain why one cannot make these particular benches. It is apprehended, analytically speaking, as the feature characteristic of some set of possible worlds in which a certain bench-back weight is unfeasible. And the second we are capable of speaking in this manner (or rather – as the designers do – acting in this manner), we have left behind the sort of ontological holism to which ANT is committed. For an entity to be a feature characteristic of some happening across a number of possible worlds requires us to imagine that particular (a clump of Inari’s novel material) maintaining its identity across those differing worlds (which is, of course, just another term for differing contexts or networks) and furthermore to imagine it as carrying the same qualities, attributes, or properties (the ones which ruin the bench) too. Exactly how sincerely we should approach an entity – how free it is from the sinewy rhizomal réseaux ( Latour, 2005a :129), how much of its behavior inheres to it in its own right – is demonstrated in such unassuming experiments. ANT’s pseudo-Saussurean anti-essentialism and its nominalism fail to capture the practical metaphysics elaborated in such a testing regime. And what this general practice of exploration and discovery grants material particulars, as a necessity, is being. Something like what Harman (2002) misleadingly calls ‘tool-being’. 12 What tool-being designates is a substance: not one predicated on a billiard-ball metaphysics, but on a recessive ‘subterranean’ nature which recedes from all relations. For Harman Heidegger’s vorhandenheit (presence-at-hand), designates all relations; from those of a detached human perceiving a broken hammer, through to the brute causality of raindrops hitting a tin rooftop. Zuhandenheit (readiness-to-hand), although traditionally read as a specifically human mode of engagement with a certain class of objects (tools), becomes a term designating a crucial dimension of all entities: their reserved, singular, hidden being. It designates a life for material things beyond the networks of relations in which they are implicated. What makes tool-being so necessary for a practice of discovery is that, without depths untouched by relations, little would be gained by subjecting the material to such trials. For example, imagine if Nicolas was to take a sheet of z , and lock it into a vice. If we take ANT’s relational holism seriously, we would have to think of this piece of z as being exhaustively characterized by the relations in which it is currently embedded. In other words it would be without inherent qualities, reducible to its present encounter with vice, air, designer etc. But then, let us imagine that as part of his tests he begins to saw at the sheet with a hacksaw. It begins to tear, giving way to the blade. Something is now happening to the sheet of z which has never happened before – it is cut down the middle. Now what is crucial here is that it is not the relations in which z is embroiled which are cut – we are not sawing through the negative semiotic imprint of vice and air and Nicolas etc... This is clear because we are achieving something with the saw which those other entities could not. We are cutting z , not z as previously encountered by vice, air, sunlight etc. For the new relation with the hacksaw to be able to elicit a novel response from z relies on z holding something of itself in reserve from the entities to which it previously related. (This formulation is adapted from an example of Harman’s (2002 :230).) In other words, for change or novelty to occur at all – for a mode of discovery to be possible – entities must have secrets (like z’s sawability) held in reserve from whatever networks of relations they might find themselves in from moment to moment. Or as Heil (2003 :109) puts it: “Imagine a world consisting of exclusively of particulars whose nature is exhausted by relations these bear to other particulars... Would such a world differ from a world consisting of a static, empty space?”. Figure 4: Chris's table of 1:10 scale models. Chris: Well I started with just an idea at first; and this was a way of developing it really. You find out what can’t work, what will work, really quickly. So down the track I’ll know... that yip, so that joint will do well... in the whole situation. Chris: You can’t know that to know... what you’re gonna have in there until you, before you do a proper detailed [model] [...] It’s so much better to do it in a full size... scale model because it represents things better... and more accurately [...] like a realistic sort of view. Like it is cool to do little representational models but- because yeah it is quite easy to get it built up on the computer and then get it made up by a machine. But yeah... it’s still much better to get it done up on a full scale. And plus so, it’s just more realistic really. Because you get real materials. Jon: Well that’s one thing that helps with actually making it real- like that backpack that I made actually looked completely different on the computer to how it looked in real life. Taira: Well materials the big thing! You can’t draw or render materials. You don’t know what they are. Taira: And like oh! And the other big thing is like you can, you can make a shape, and you can render it on the computer as metal, but that doesn’t mean you can make it in metal. And you can, you can do whatever you like on the computer but it doesn’t- it can’t be real [...] You’re loosing the reality of the process. Taira: -well some metals, the further away on the periodic table they are, the um, worse they react with each other. So you can’t necessarily, put two pieces of metal together... because they’ll start, well one will just eat the other away. But that- that wont happen on the computer. Figure 5: As the designer engages with the material, the horizon of possible objects (PO) narrows. Taira: See that backpack, well you could draw, you can draw that a million times, as much as you want, but you’re never gonna really know what it’s like to go over a body, what the straps gonna look like. You can [deduce] what they’re gonna look like, but you never know what it’s gonna feel like on your skin. Jon: -how the pockets are gonna work. Taira: You don’t know that until you make it. And once you’ve made it you can go back to your computer model and change it. Or you can go back to your drawings and alter it. Jon: How it’s hidden or if it’s not hidden. Taira: And just like... what it’s like to use the zipper. A reservedness. Individual entities, although they relate with others in interesting ways, do so ‘in their own right’. That is, some of their nature is held in reserve from whatever relations they may be embroiled in at this or that time. They are not exhausted by networks. A discretion. As a consequence of this individual entities are discrete. They can never be swallowed up by their contexts because their reserved inherent qualities mark them out as separate. A sincerity. A further consequence of their reservedness is that encounters with such particulars are characterised by discovery. Reshuffling our relations with entities does not multiply or alter them as much as it taps into new sections of their reserved nature. And so a language of finding is most appropriate to such encounters. An independence. Because of their reservedness objects need not be predicated on effects. They can be granted a life outside syntagms of human action. A weight. I think most crucially for social theory, these designers throw into stark relief the capacity of the material to distinguishing between the possible and the impossible. In other words, material entities allows certain happenings and preclude others. At the beginning of this paper I suggested that the radical holism of ANT’s ontology is in part a consequence of the intellectual climate in which it was born. As Harman (2002 :230) puts it, intellectuals in recent decades “have gotten very much into the habit of poking holes in all remaining versions of the old substance-concept, and measuring their own critical liberation by the extent to which they are able to do so”. Faced with the twin perceived threats of, on the one hand, a naive scientific materialism content to reduce the material world to a deterministic collection of dead particles, and on the other, an equally naive sociology of science and technology trading in a world of centered disembodied subjects who talk, look, agree and believe, but never get their hands dirty; it is not difficult to see the utility of ANT’s ontological project. But as Harman (2002 :184) notes, these are ideas “once but no longer liberating. It is an idea that fights the last war instead of the next one”. Now that such relational thinking has succeeded at complicating those various chunks of social and material stuff, which once looked so commonsensical and necessary, it is time to start taking stock of what has been lost in such a venture. The point is not to be reactionary, but to acknowledge that only part of a story has been told. Reinventing our ability to talk about the substantive dimensions of entities is, I believe, the next important project for an ontologically minded social theory. That is to say, a sociology of science and technology requires an understanding of the material world which is at least as rich and complex as that employed by those they study. And the angle from which these designers approach that world, with its realism and its respect for substance, deserves a place in such an understanding. We need to take these dimensions of the material as seriously as these students do if our accounts are to have the same ring of sincerity. It needs to be felt in such accounts that the material world has a resistance and a reticence which can never be fully muted by the contingencies of our local practices and network building enterprises. The material weighs in decisively. It is not a mere bundle of relations whose reshuffling is constrained only be our ingenuity. Or rather, such a relational perspective taps into only one aspect of the material world. The ‘deep’ and ‘heavy’ material which we have focused on needs recognition. Exactly how this might proceed is something of an open question. One path towards achieving this would be to recognize the movement in figure 3 as a more generic moment in material life. That is, just as the designers practiced a material which constrained their range of design choices, we all experience the material world as possessing modal weight . Material things serve to designate the possible, grounding some actions and precluding others. They help to establish and delineate the range of possible worlds to which we have access at any one time. Any element which bends space around itself, makes other elements depends upon itself and translates their will into a language of its own [...] Instead of swarms of possibilities, we [now] find lines of force, obligatory passage points, directions and deductions. This definition overlaps fairly well with the notion of modal weight. It is just another way of saying that, in as much as an entity is real – existing in its own right – it will show itself as a feature characteristic of worlds in which certain events occur. The entity will demonstrate a modal weight which causes relative possible worlds to apprehend it as necessary. Equally it will foreclose access to other possible worlds. To the degree that we actually engage with that entity, we will be unable to take certain paths. Although the language is perhaps a little more ‘analytic’, this is very much in keeping with ANT’s ‘sociology of translation’. The crucial difference is that I believe such modal weight – such ‘bending of space’ – is an epiphenomenon of substance. It is what resides in the reserved underbelly of entities, not in their relations with one another. When Law (2002b :92) says that “in ANT the possibilities of the world are constrained, but contingently so” I find this just a little too easy, a little too light. 14 The weight is there but it is not located. The sincerity is absent, and we still have an image of lines of force which require only local networks and practices for their existence. 15 Gibson’s (1979) affordance fares much better on this point. 16 Although employed to describe relations (between organisms and the world) affordances are still viewed as more a less inherent qualities of entities . Even if a particular affordance is never articulated in practice it never the less exists as a potential ( Keil, 1999 :5). Here the modal weight – the lines of force and bending of space – is properly located beneath local relations, in the internal relation- independent substance of things. Objects are granted the capacity to set “the limits to what is corporeally possible [without determining] the particular actions which humans may engage in” ( Urry, 2000 :204). Whatever analytic device is chosen, recovering substance from the wreckage of the ‘last war’ is a worthwhile project. And doing so in a manner which keeps hold of what is still ‘liberating’ in ANT’s approach to social theory is a necessary one. 17 Whether this involves some adaptation of affordance, a sterner notion of translation, more of my tedious possible- worlds talk, or some completely new contrivance, I am certain that the result will be accounts in the Actor-Network tradition which better capture the interesting, recalcitrant, ‘full-blooded’ contours of the world. Arora, J., S. Burns, and M. Huang. 1997. “What is optimization?” In J. Arora (ed. ), Guide to structural optimization. New York: American society of civil engineers. Baber, C., and C. Barber. 2003. Cognition and tool use: Forms of engagement in human and animal use of tools. London: Taylor and Francis. Bessant, J. 1983. “Management and manufacturing innovation: The case of information technology.” In G. Winch (ed.) Information technology in manufacturing processes: Case studies in technological change. London: Rossendale. Budinski, K. 1979. Engineering materials, properties and selection. Englewood Cliffs: Prentice-Hall. Callon, M. 1986. “The sociology of an actor-network.” In M. Callon, J. Law, A. Rip (eds.) Mapping the dynamics of science and technology. London: Macmillan. Callon, M. 1999. “Actor-network theory: The market test.” In J. Law, J. Hassard (eds. ), Actor Network Theory and after. Oxford: Blackwell. Callon, M., Latour, B. 1981. “Unscrewing the big Leviathan: How actors macro-structure reality and how sociologists help them to do so.” In K. Knorr & A. Cicourel (eds. ), Advances in social theory and methodology: Toward an integration of micro and macro sociologies. London: Routledge and Kegan Paul. Constant, E. 1999. “Reliable knowledge and unreliable stuff.” Technology and Culture 40(2). Dant, T. 2004. “The driver-car.” Theory, Culture & Society 21(4/5): 61-70. Divers, J. 2002. Possible worlds. London: Routledge. Dusek, V. 2006. Philosophy of technology: An introduction. Oxford: Blackwell. Gibson, J. 1979. The ecological approach to visual perception. Boston: Houghton Mifflin. Guala, F. 2003. “Experimental localism and external validity.” Philosophy of Science 70(5/1). Haftka, R., Vitali, R., Sankar, B. 1998. “Optimization of composite structures using response surface approximations.” In C. Soares, M. Freitas (eds. ), Mechanics of composite materials and structures. Dordrecht: Kluwer Academic. Hansen, M. 2000. Embodying technesis: Technology beyond writing. Michigan University Press. Harman, G, 2002. Tool-being: Heidegger and the metaphysics of objects. Chicago: Open Court. Heidegger, M. 1962. Being and time. New York: Harper & Row. Heidegger, M. 1971a. “Building, dwelling, thinking.” In A. Hofstadter (ed. ), Poetry, language, thought. New York: Harper & Row. Heidegger, M. 1971b. “The thing.” In A. Hofstadter (ed. ), Poetry, language, thought. New York: Harper & Row. Heil, J. 2003. From an ontological point of view. New York: Oxford University Press. Hutchby, I. 2001. “Technologies, texts and affordances.” Sociology 35(2): 441-56. Johansson, I. 2004. Ontological investigations: An inquiry into the categories of nature, man, and society. Lancaster: Ontos. Keil, F. 1999. The MIT encyclopedia of the cognitive sciences. Cambridge, MA: MIT Press. Kennedy, D. 2002. Rethinking reality: Lucretius and the textualization of nature. University of Michigan Press. de Laet, M., and A. Mol. 2000. “The Zimbabwe bush pump: Mechanics of a fluid technology.” Social Studies of Science 30(2). Latour, B. 1983. “Give me a laboratory and I will raise the whole world.” In K. Knorr, M. Mulkay (eds. ), Science observed: Perspectives on the social study of science. Los Angeles: Sage. Latour, B. 1988a. The pasteurization of France. Cambridge MA: Harvard University Press. Latour, B. 1988b. Irreductions: part II of the pasteurization of France. Cambridge, MA: Harvard University Press. Latour, B. 1988c. “The politics of explanation: an alternative.” In S. Woolgar (ed. ), Knowledge and reflexivity: new frontiers in the sociology of knowledge. London: Sage. Latour, B. 1996. Aramis, or the love of technology. Cambridge, MA: Harvard University Press. Latour, B. 1999a. Pandora’s hope: essays on the reality of science studies. Cambridge MA: Harvard University Press. Latour, B. 1999b. “On recalling ANT.” In J. Law, J. Hassard (eds.) Actor Network Theory and after. Oxford: Blackwell. Latour, B. 2004a. “Why has the critique run out of steam? From matters of fact to matter of concern.” Critical Inquiry 30(2): 25-48. Latour, B. 2004b. 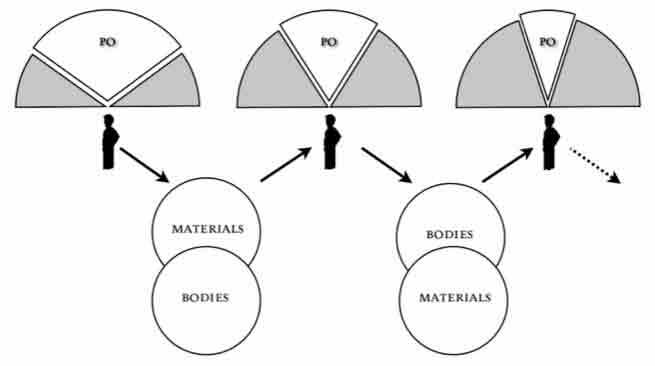 “How to talk about the body: The normative dimension of science studies.” Body & Society 10(2/3): 205-29. Latour, B. 2005a. Reassembling the social: An introduction to actor-network theory. Oxford: Oxford University Press. Latour, B. 2005b. “What is given in experience?” Boundary 2(32): 223-37. Latour, B., and P. Weibel. 2005. Making things public: Atmospheres of democracy. Cambridge, MA: MIT Press. Law, J. 1986. “On the methods of long distance control: Vessels, navigation and the Portuguese route to India.” In J. Law (ed. ), Power action and belief: A new sociology of knowledge? London: Routledge and Kegan Paul. Law, J. 1987. “Technology and heterogeneous engineering: The case of the Portuguese expansion.” In W. Bijker, T. Hughes (eds), The social construction of technical systems: New directions in the sociology and history of technology. Cambridge, MA: MIT Press. Law, J. 1999. “After ANT: Complexity, naming and topology.” In J. Law, J. Hassard (eds. ), Actor Network Theory and after . Oxford: Blackwell. Law, J. 2002a. Aircraft stories: Decenetering the object in technoscience . Durham: Duke University Press. Law, J. 2002b. “Objects and spaces.” Theory, Culture & Society 19(5/6). Law, J., and A. Mol. 1995. Notes on materiality and sociality. The sociological review 43. Law, J., and A. Mol. 2001. “Situating technoscience: An inquiry into spatialities.” Society & Space 19. Law, J., and V. Singleton. 2000. “Performing technologies stories: On social constructivism, performance, and performativity.” Technology and Culture 41(4). Lesko, J. 1999. Industrial design materials and manufacturing: Materials and manufacturing. New York: Wiley. Levinas, E. 1988. Existence and Existents. The Hague: Martinus Nijoff. Lilja, D., and J. Yi. 2006. “Statistical techniques for computer performance analysis.” In L. Kurian and J. Lieven (eds. ), Performance evaluation and benchmarking. New York: Springer. van der Linden, W. 2005. Linear models of optimal test design. Boca Raton: Taylor & Francis. Lupton, D. 1999. “Monsters in metal cocoons: ‘Road rage’ and cyborg bodies.” Body and Society 5 (1): 57-72. May, T. 1997. Reconsidering difference: Nancy, Derrida, Levinas, and Deleuze. University Park, PA: Pennsylvania State University Press. Mol, A. 1999. “Ontological politics: A word and some questions.” In J. Law, J. Hassard (eds) Actor Network Theory and after. Oxford: Blackwell. Mol, A. 2002. The body multiple: Ontology in medical practice. London: Duke University Press. Nietzsche, F. 1996. Human all too human: A book for free spirits . Cambridge: Cambridge University Press. Nietzsche, F. 2001. The gay science: With a prelude in German rhymes and an appendix of songs. Cambridge: Cambridge University Press. Rorty, R. 1996. “Relativism: Finding and making.” In R. Rorty (ed. ), Philosophy and social hope . London: Penguin. Sharrock, W., and B. Anderson. 1996. “Organizational innovation and the articulation of the design space.” In T. Moran and J. Carroll (eds. ), Design rationale: Concepts, techniques, and use . Mahwah: Lawrence Erlbaum Associates. Stankiewicz, R. 2002. “The cognitive dynamics of biotechnology and the evolution of its technological systems.” In B. Carlsson (ed. ), Technological systems in bio-industries: An international study . Norwell: Kluwer Academic. Stengers, I. 2002. Penser avec Whitehead: Une libre et sauvage creation de concepts. Paris: Gallimard. Teil, G. 1998. Devenir expert aromaticien: Y-a-t-il une place pour le goût daCussinns les goûts alimentaires? Revue de Sociologie du Travail, September. Ullman, D. 1992. The mechanical design process. New York: McGraw-Hill. Urry, J. 2000. Sociology beyond societies: Mobilities for the twenty-first century . London: Routledge. Whitehead, A. 1929. Process and reality: an essay in cosmology . New York: The MacMillan Company. Zubiri, X. 2003. Dynamic structure of reality: Translated from the Spanish and annotated by N.R. Orringer. Champain: University of Illinois Press. 1 I use ‘ANT’ here very broadly to designate a whole raft of work across a variety of ‘ologies’ – including those works which would consider themselves ‘after’ ANT. It is of the nature of the perspective that it is difficult to pin down ( Law, 1999 ; Latour, 1999b ), but I think it would be silly to argue from this that there is nothing there at all. What I am designating here is the range of ideas elaborated by the founding authors and texts which, no matter how far thinkers might have traveled from this or that acronym, remain central to the perspective. 2 It is often difficult, however, to establish whether such thinking represents beliefs about what the world is like, or useful relatively world-neutral methodological prescriptions. This is a distinction which ANT might try to avoid, as it raises troublesome questions of correspondence; but it is also one which Latour has made repeatedly in his most recent major work: “Surely you’d agree that drawing with a pencil is not the same thing as drawing the shape of a pencil.” ( Latour, 2005a :142). The risk is that given this lack of clarity I may appear to be stamping my foot because the letter ‘B’ doesn’t ‘buzz’. In what follows I intend to do my best to avoid this by hearing out whichever angle seems the most charitable. And as my own claim is both methodological and ontological – I intend to argue not so much that ANT’s account of materiality is simply wrong, but rather that its heavy-handed holism is muting other interesting dimensions of objects – I think I can successfully sidestep this problem. 3 Law has riffed on this theme at some length ( Law, 1999 , 2000 , 2002b ; Mol & Law, 1994; Law & Mol, 1995 , 2001 ; Law & Singleton, 2000 ) bringing his notion of multiple spatialities into the mix. 4 This ‘ Gegenstände-Dinge ’ opposition has become increasingly popular in ANT writings ( Latour & Weibel, 2005 , Latour, 2004a ). 5 Mol (Ibid:41-2) contrasts the term ‘enact’ with ‘perform’, ‘construct’, and ‘make’. However, I am using them all as synonyms in this paper. I don’t believe the difference in connotation is as great as she suggests. In any case it is certainly not large enough to confuse my fairly brief summary of ANT ideas. 6 This research is based on observations and interviews conducted in 2006 with twelve industrial design students from Victoria University of Wellington’s School of Architecture and Design, and Massey University’s Institute of Design for Industry and Environment. Students participated in unstructured interviews conducted at their work-spaces, where they discussed their projects. The research was conducted with ethical approval from Victoria University’s Human Ethics Committee, with the assistance of staff from the relevant institutions. 7 Names have been changed in the interests of privacy. 8 In the interests of accessibility I have adopted a very simplified method of transcription for the designers’ interview data. Brackets indicate corrections or commentary. Bracketed full-stops indicate points where dialogue has been edited. All other punctuation can be treated as in the main text. 9 From the 97.5 percentile male to the 2.5 percentile female is a common spread, although probably too much for this particular design. 10 Now to anyone familiar with the design process this will seem a desperately impoverished account. Aesthetic concerns have been largely ignored, as have problems of marketing, user-studies, documentation... My description is certainly shallow when compared with the complex accounts produced by designers themselves in their reports and theses. And it could well be argued that what I have described differs little from the ‘in-house’ notion of ‘design space’ ( Bessant, 1983 ) - the differentiation of the “feasible and infeasible” given a certain range of constraints ( Arora et al., 1997 :8-9). As for the latter, whilst what I am describing is similar to the notion of design space I have avoided using that term because what I am getting at here is a more limited concept – I am interested in such a ‘space’ only in as much as it is narrowed by the material world. The more expansive design space concept can have a very technical usage in testing and optimization literature (ie. Lilja & Yi, 2006 ; van der Linden, 2005 ; Haftka et al., 1998 ), conflates more factors than I wish to deal with, and as such can be explored as more negotiable than the closing I am describing (ie. Sharrock & Anderson, 1996 ). And so too the possible charge that the design-space concept is less characterized by constraint than that which I am presenting (especially for more experienced designers who, through their greater tacit knowledge, work in a less “discovery driven” ( Stankiewicz, 2002 :39) manner) can be left aside. Even when the material world is experienced as presenting design opportunities as opposed to closing off options it remains a closing in as much as the material suggests this design rather than that. And in any case there is, as Constant (1999 :330-1) notes, still a major asymmetry between the feasible and unfeasible: that something is possible in no way means it will be done; that it is impossible means that it certainly will not. The former charge – that my account is an impoverished description of the design process – I am happy to concede. My intention is not to tell designers how they work, or to contribute concepts to a theory of design. My intention is to abstract from the work of these designers a lesson about materiality. 11 If not there would be no way of judging the sensitivity of the covariation between them (which is what the notion of articulate propositions boils down to) – how could a proposition be judged inarticulate if there are no pre-existing distinctions to be missed? 12 The term has nothing to do with tools except that the notion is elaborated through a re-reading of Heidegger’s ‘tool analysis’ ( Heidegger, 1962 ). 13 Again, intellectual property prevents a more detailed description. 14 The same ‘light way out’ can be seen in May’s interpretation of Deleuze: “rather than take Deleuze’s (periodic) tack of positing Being as difference, I suggest that we can have all the ontological differences we need if we are more austere in our ontology. Instead of seeking Being itself and requiring of it that it contain all the differences that we would like to see instantiated in our world, we can turn directly to the practices in which people are engaged. Practices are a rich source of ontological posits; differences abound in different practices. Thus, by jettisoning the project of a philosophical ontology, we open the way to the kinds of ontological differences Deleuze commends to us.” ( May, 1997 :18). 15 I have same problem when considering Latour’s experimental localism. Science’s regularities, generalizations, and universality are seen as the consequence of extended networks of technical relations, but if substance has the modal weight I suggest then this may not be the case. If the substance of entities can restrict our access to possible worlds ‘in its own right’ then laws of nature may be more or less necessary, and the practices and networks in which they appear more or less contingent. In other words, the substance of the world may establish a ‘nomological modality’ ( Divers, 2002 :4) – a constraint on what is possible which no changes to networks or practices can defy. And if this is the case the generalisation of Newton’s laws begins to look very different from the exporting of cheeses ( Latour, 1988b :227). That is, there are many different actually-possible worlds in which we ship cheeses, or do not ship cheeses. And there may be many in which we demonstrate laws of nature via costly local networks of instruments and expertise (or choose not to). But, in this view, there may still be none in which we actually act counter to those laws. If we accept that the material weighs in decisively, restricting what is possible, then we have to admit the possibility that it is exactly such restrictions which the scientist’s ‘laws of nature’ capture. And if that is the case then they require no networks to travel. 16 Gibson, a psychologist, offered affordance as a means of coupling perception and action in accounts of an organisms engagements with the ‘outside’ world. Certain material entities, in this view, suggest certain responses, with the affording world, perceiving mind, and acting body “conjoined into a single dynamic unit... things in the world exist as... collections of features that ‘afford’ (or support) some specific response” ( Baber & Barber, 2003 :54). It has gained some sociological currency, and is sometimes invoked as a counterweight to ANT-style accounts of human-technology relations. See for instance Hutchby (2001) ; or compare Lupton’s (1999) and Dant’s (2004) accounts of driving. 17 And there is still much liberating in ANT’s approach. Unlike many realist caricatures and criticisms of ANT, mine is done with affection.